As from today the participants are taking over the stage. We are starting with the workshops that are going to be facilitated by the participants who are working in pairs. Each pair has 40 minutes time to deliver a workshop on a topic they feel most confident in. After each workshop, the pairs are receiving constructive feedback by the group and by the trainers. This feedback helps them to improve their work in the future as facilitators. We captured the first impressions of each pair right after they came out from the session. Day 5 is the day when participants are divided into pairs and they are working on preparations for their workshops that they will facilitate starting from tomorrow. This is the practical part of the training course when participants should put into practice all the inputs they got earlier this week and in a safe learning environment to try new approaches and learn from the constructive feedback given by the participants and the trainers. Mornings always start slowly in the quiet space where everyone is taking some time to prepare him/herself for the day by using the reflection diary. Right after that, today we started with brief presentation about the relevance of Learning Experience Design in Youth Work. So, what we did is in small teams of 4 or 5 we were invited to design a common learning space that will hold different “corners”. Each corner developed by one of the groups. Step 1: The topic was randomly chosen: human rights. Once the topic was chosen each group could separately brainstorm subtopics within that main issue (eg: small aspects that can be explored when learning about human rights such as: freedom of speech, torture, laws, conventions, etc.). The brainstorm of each group was recorded in a piece of paper. As usual today we started again in our quiet space reflecting about the learning points from yesterday. Setting the stage for today’s challenge. Following our discussion from before, today we dive deeper into the elements of group dynamics. How does the group develop, grow and dissolve? 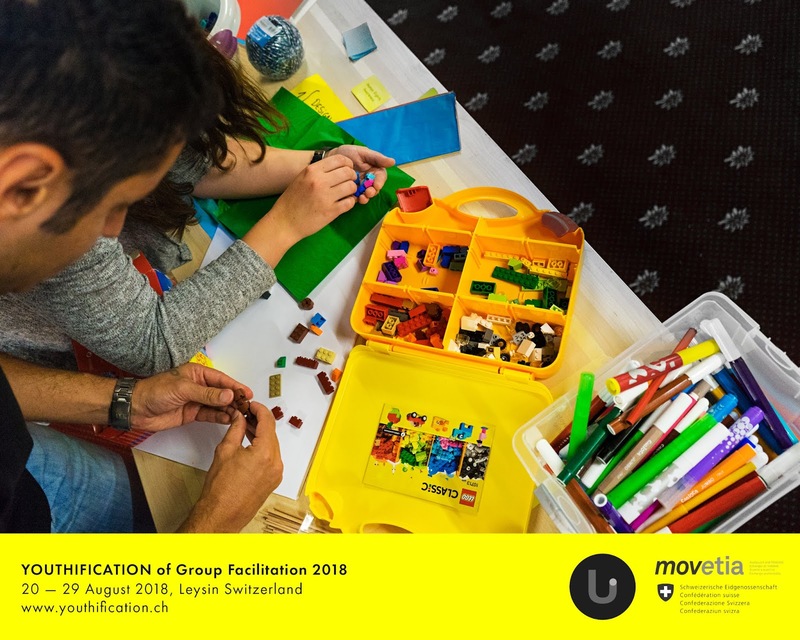 What kind of processes are happening during this development and how to identify the needs of the young people from the group? To give adequate answers on these and many more questions, we had few theories on the menu today to digest. 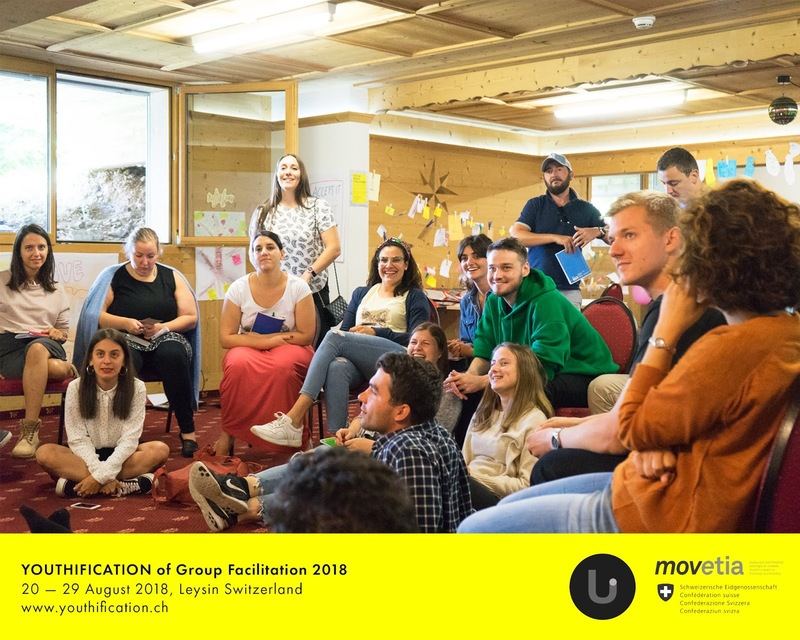 By connecting the theories with the experience of the group members, we managed to bring better understanding and raise awareness about the role of the facilitator in the group and the responsibilities that come along. It is morning again in Leysin. We all got together in the working room anticipating what comes next. From today on, we will always start the day with the reflection diary, individually assessing and reflecting on the day before, what did we learn, what is still open as question and topic, how do we achieve our goal that we have set for each one of us. After 15 minutes of reflection time, we were already ready for the first session of the day which was emphasizing the importance of the group work. We explored what is the meaning of group work and first of all defining what a group really is. Coming back to the Kolb Cycle and non-formal learning concept, the group was divided into small groups and worked on creating posters with the moto: “in youth work being in a group means…” After a session of sharing and discussing, each group had the chance to present in plenary their outcomes.